Since the emphasis of this post is on answers to FAQ, I have left it free of illustrations. However, there are links to appropriate images embedded throughout. Look for colored text which appear underlined when the cursor points their way. Most of these are borrowed from other posts at this site. Questions are italicized and bolded. Answers are not. I’m planning a trip to Brevard but have a very tight schedule. Where is my best chance to see a white squirrel? The key word in your question is “chance.” We do not keep our white squirrels in captivity. In fact, there is a city ordinance against that. Like all animals, squirrels have regular patterns of behavior over long periods of time but are very unpredictable at any given moment. Weather, hunger, and seasonality are just a few of the factors that may alter their usual behavior. So is human activity. In other words, there are no guarantees. The best way to ensure seeing one is to stay here for awhile. Although the white variant makes up almost a third of our squirrel population, some regions have none while others have more than half. Taking a look at the most recent results might suggest where to start. A new feature added recently ranks the 35 Sectors of the study area according to percent white and white squirrels per acre (click here for the rankings). But remember that many of these areas are residential with little visibility and/or parking . In addition, while most home owners are proud of their white squirrels, they might be suspicious of strangers walking through. Therefore, I would suggest trying “public places.” Silvermont and Franklin Parks have squirrels but not in large numbers. The best all around location is probably Brevard College which is also easy to find on N. Broad Street just downhill from the courthouse. It offers a large park-like environment with scattered trees for squirrels but yet good visibility for squirrel watchers. Within the campus, itself, the best areas are on the lawns surrounding the main entrance, along the creek, and in the area between the barn and the President’s house. Where ever you go, park the car and walk. The more time you spend on foot anywhere in Brevard, the more likely you are to spot a white squirrel. Happy hunting (with your camera, that is). How many white squirrels are there in Brevard? First, the Brevard white squirrel is no longer restricted to the city of Brevard. Although released near Johnson and Main Streets (see Barbara Mull Lang’s account) in the early 1950’s they have spread by one means or another to over a fifty mile radius in western North Carolina (see distribution map). The annual Brevard Squirrel Count only covers a 3 square mile area following the original city limits (before any annexations) and is not meant to be a census. Not all squirrels will be out during the one hour count and not all squirrels that are out will be seen by the counter. Thus, the Count, itself, vastly underestimates the number of squirrels but it is, we think, an accurate estimate of the percent white. Using other methods we estimate that there are approximately 3-5,000 squirrels (white plus gray) in the study area. Multiplying that number by the percent determined by the annual count (now approaching 33.3%) we come up with about 1,000 white squirrels. Pretty impressive when you consider that the most other communities boasting a white squirrel colony can claim is a few hundred. Are white squirrels a separate species? Not unless you live in Thailand or one of the Philippian islands (where all white species of tree squirrels actually exist). 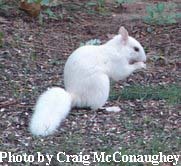 In all other cases, including here in Brevard, the white squirrel is simply a coat color variant. That is, they are part of the natural variation occurring in a very variable species, in this case the Eastern Gray Squirrel (Sciurus carolinensi), which also includes black variants in many parts of its range. Think of all the variation that occurs in our own species such as in eye or hair color; hair color in a squirrel may vary not just from individual to individual but from one part of the body to another (for more on this subject, see post “What is a white squirrel?). How did white squirrels get to Brevard? A pair were trapped in Florida and brought to Brevard as captive “pets” in the late 1940’s. They were then “released” in the early 1950’s. They had then the same markings (head patch and dorsal stripe) that distinguish our Brevard white squirrels today. Once again, I refer you to Barbara Mull Lang’s account (click here) for the details. Where did the Florida squirrels come from? There is some controversy here. Local folklore says that the squirrels were part of a circus. While traveling through northern Florida, the circus caravan wrecked and the squirrels escaped into a local pecan orchard where they flourished. The circus owners supposedly acquired the squirrels from Hawaii. This is where I became suspicions. Hawaii is an oceanic island with no native terrestrial mammals. As mentioned above, there are species of all white squirrels in Thailand and the Philippines but these are not only different species but in different genera (and distantly related ones at that). The likelihood that such species could be introduced halfway around the world and fully interbreed with the Eastern Gray Squirrel is very remote. There is a much simpler explanation. The squirrels are, indeed, from Florida but they weren’t introduced; they are native Floridians. Sightings of squirrels with similar markings have been reported from Kissimee and Orlando (see Melanie) in central Florida to Jacksonville and the panhandle in northern Florida. Recently, I have received sightings surrounding the Charleston SC area. Throughout much of this range they are rare but there are some areas where they are unusually abundant such as the aforementioned pecan orchard in Madison FL. The man who gave the squirrels to Barbara Mull Lang’s uncle was thought to be “harvesting” them for sale. A story implying an exotic origin may simply have been a marketing ploy. Do white squirrels get picked on? White and gray squirrels that have been raised together show no evidence of ostracizing one another. They forage side by side (see White and Gray Siblings in the post entitled “Overview of Findings”). Non-siblings probably show the same territorial tendencies toward each other, regardless of color, although this has not be fully documented. How can I get white squirrels to release in my neighborhood? The city of Brevard has an ordinance against trapping or harming white squirrels. The Heart of Brevard and the White Squirrel Research Institute are located withing the city limits and therefore do not participate in such activities and discourage others from doing so as well.